M-Systems model 53U is a 96-mm-square Multi Power Monitor mounted on a panel surface. 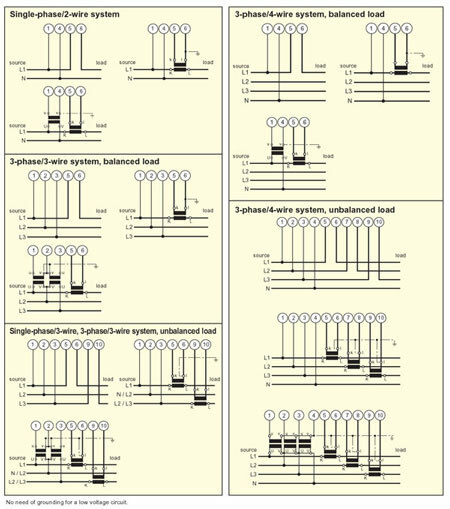 One model can be used for single-phase/2-wire and 3-wire, three-phase/3-wire and 4-wire systems (Figure 1). Users can freely choose and program major variables in heavy-current power systems, such like AC voltage/current, active/reactive power, power factor, AC frequency deviation, apparent power, active/reactive energy and up-to-the-31st harmonic distortions. Measured variables also include the maximum/minimum/average values, in total of 500 types. Up to 1800 patterns of display combinations are available. Figure 1. 53U connecting mode. 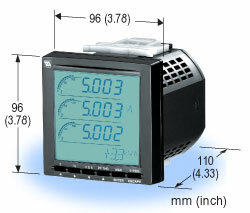 Four lines of LCD display are standard. The fourth line which usually shows accumulated energy count is automatically switched to an alarm indicator: flashing text tells you which variable is in an alarm range. It also helps you in programming the monitor by indicating menu items in text format so that you could easily navigate through the programming menu without consulting instruction manuals. The top three displays have small bargraph indicators on the left end to show present values graphically in %. Best legibility in different environmental conditions is ensured by a backlight of which brightness is adjustable in four levels. 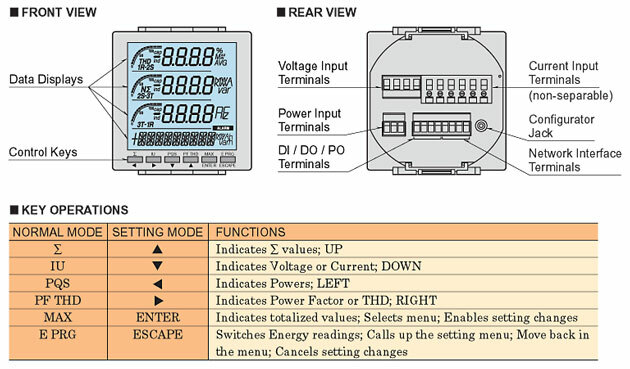 Display item combinations are switched by pressing front keys from voltage, current, power and so on (Figure 2). Passcode lock is set to prevent the operator from accidentally changing setting (such as primary/secondary voltage ratings). All parameters and energy count values are stored in a nonvolatile memory, which is not lost even in case of power loss. After you have looked through many different views, you can always come back to a specific display view by setting My Default View. If the monitor control keys are untouched for a certain time period, the monitor automatically returns to the users default view. Figure 2. 53U front and rear views. RS-485/Modbus communication is a standard feature of the 53U. 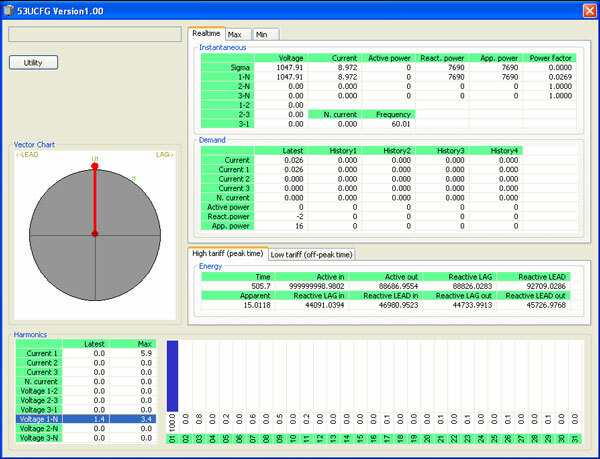 All measured and computed values from multiple power supply lines can be sent to a host PC to be monitored and analyzed. Figure 3. 53UCFG initial window. Figure 4. 53UCFG Monitor window. Even with the user-friendly design in programming, the 53U has still so many parameters if you want to go to its extreme limit of performance. Then the 53UCFG PC Configurator will help (Figure 3). The 53UCFG is a Windows based, fill-in-the-blank type program used either locally via a special cable (model: MCN-CON) or remotely via Modbus network. You can upload present setting from the 53U, modify it and download the new setting to the monitor. Configuration files can be saved as a file, called up and compared with another set of configuration uploaded from the 53U. It is easy to troubleshoot in programming when discrepancies are highlighted in red in the Compare window. The 53UCFGs another feature is the Monitoring window. All measured and computed values can be monitored on the screen, and a vector chart visualizes phase differences in voltage and current (Figure 4). Open collector output is available for either energy count or alarm. Contact function, pulse weight, alarm setpoints and other parameters are freely selectable. At the systems startup testing, the contact signal can be used in simulated mode, so that pulse signals can be sent to confirm connection without actually connecting to the live input. External open collector input is typically used to reset energy count memory. The signal can be also monitored at the host system via Modbus, so that the host can start/stop monitoring according to ON/OFF status of a load (e.g. motor running or not). The 53U is CE marked, conforming with EUs EMC/LVD Directives, tested according to EN61010-1 and classified Polution Degree 2 and Installation Category III environment. The front panel conforms to IP 50 (IEC 60529). Copyright (C) 2010-2019 M-System Co., Ltd. All rights reserved.